Rodney Brown of Chippenham has sent us a most interesting family document, which relates to the South Staffordshire Railway, and information about the recipient and his family. To this we have added information from the website Perry Barr and Beyond which, in a most remarkable collection of material, contains many reference to John Nurthall Brown and which will add to some of the details given here. My great, great, grandfather, John Nurthall Brown, was born at Nuneaton on the 12th May 1821. According to his obituary in the Handsworth Herald he "commenced business as a lad with Messrs. Pickford & Co in Birmingham". The next steps in his career are not known but he seems to have risen rapidly. On the 13th March 1845 he married Emma Rosetta Smith at St. Mary-de-Lode, Gloucester. 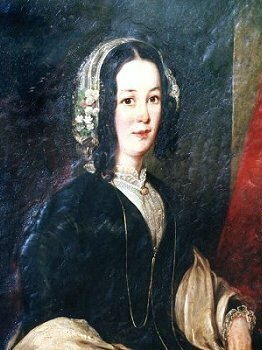 Emma was a member of the Smith family of artists and portrait painters who were part of the group of artists known as the Cotswold Artists. These portraits of John Nurthall Brown and his wife, Emma, are family heirlooms in my possession. He is next found as a manager of the South Staffordshire Railway Company. 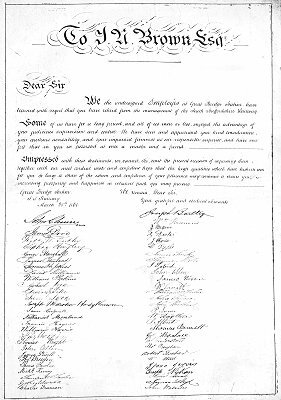 When he joined them is not recorded but when he left in, 1861, the document shown on the right was presented to him by the employees at Great Bridge Station. The document is transcribed below; the list of subscribed names may be of interest both to genealogical researchers and railway historians. To J. N. Brown Esq. We the undersigned Employees at Great Bridge Station have learned with regret that you have retired from the management of the South Staffordshire Railway. Some of us have for a long period, and all of us more or less, enjoyed the advantage of your judicious supervision and control. We have seen and appreciated your kind consideration, your courteous accessibility, and your impartial firmness as our responsible superior, and have ever felt that in you we possessed at once a master and a friend. Impressed with these sentiments, we cannot, Sir, omit the present occasion of expressing them, together with our most cordial wish and confident hope that the high qualities which have hitherto won for you a large share of the esteem and confidence of your fellowmen may continue to secure you increasing prosperity and happiness in whatever path you may pursue. The signatures at the top of each column are very boldly written. Those in the left column are mostly fluently written, as if the signatories were men used to writing. Those in the right column somewhat less so. One possibility is that the two leading signatures were of the two senior men, that the memorial was then taken round the clerical staff (in the left column) then taken outside to the operational staff. Some of the names, especially those in the right column, are difficult to read the transcription of them is not guaranteed correct. According to the Handsworth Herald, when John left the railway he immediately took up a post with the Cannock Chase Colliery Company and, it seems, was then, or later, appointed to the Board. At some point he handed over the active management of the company to his son, J. Newland Brown. His business and commercial career was clearly burgeoning and he was a director of Edmond Boughton & Co., metal merchants; and of the Patent Shaft and Axletree Company; and was connected, presumably as a director, with the South Staffordshire Water Company, the Gloucester Wagon Company, John Russell & Co (Walsall), Mitchell's Brewery and the Alma Tube Works, Walsall. But probably his leading role was as director and later Chairman of the Birmingham and District Bank, of Colmore Row, Birmingham. It was just after he had chaired the annual meeting of the bank, with his "usual businesslike despatch", that he was taken ill and died, on the bank's premises, on the 26th January 1895. The date of the death of his first wife, Emma, is not known, nor when he married his second wife. But the census records show that in 1881 his wife was Marianne and they were living in Anglesey House, Wellington Road. According to the Handsworth Herald, Marianne died in 1889. John had four sons and two daughters. Of those shown in the "Perry Barr and Beyond" census records (which do not include John Newland Brown), all are shown as the children of John and Marianne. It may be that Emma had died young. The records leave one son unaccounted for. But those we know about are listed below. John Newland Brown is known to have succeeded his father as the manager of the Cannock Chase Colliery. This fact, and the fact that he has the same first name as his father, suggests that he was the eldest child. Charles Frederick was the oldest, born in 1853. He became a solicitor, practising in Waterloo Street. Next was Mary Ellen, born in 1855. Albert Edward Brown was born in 1861. He became a priest of the Church of England. He died in service in either 1934 or 1935 and is buried at St. John's Church, Bishopswood, Staffs. One of the sons of the Rev. 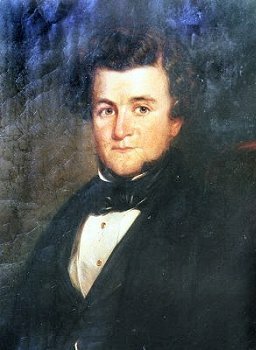 A. E. Brown was Newland Roberts Brown. He became a schoolmaster and founded a private school called Birchfield, at Tettenhall. This school relocated to Albrighton after his death in 1960. John and Marianne's next recorded child was Julia Rose Emma, who was born in 1863.